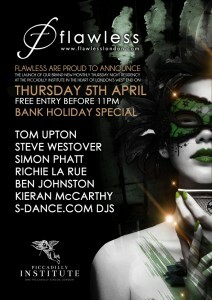 Flawless are back at The Piccadilly Institute in the heart of London’s West End on Thursday 5th April 2012. Every 1st Thursday of the month we will be taking over The Piccadilly Institute and showcasing a host full of Flawless talent with our resident djs and very special guests. The Piccadilly Institute is a place where new experiences can be gained. The unexpected, the beautiful and the bizarre are at every turn. Gorgeous in design and twisted in personality, it’s dedicated to the principles of pleasure. There’s something for every mood, every scene, every desire, a labyrinth of rooms with six different bar experiences each totally unique. If you are on the Flawless guest list it will be FREE ENTRY up until 11pm. Submit your names at http://www.flawlesslondon.com/guestlists.php £5 after 11pm for non guest list. To Party! Glamorous & Dazzling. Photo ID is essential, No ID No Entry.